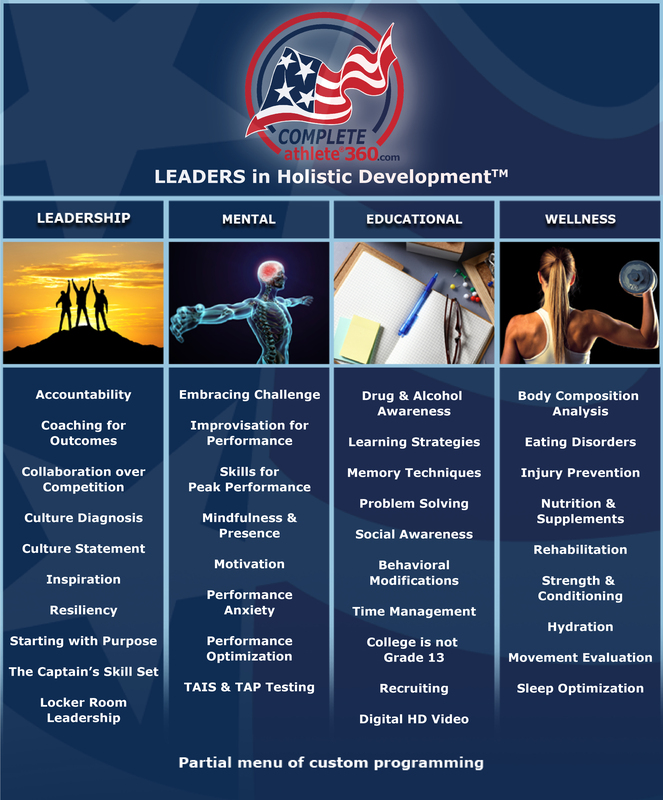 Complete Athlete®360, a holistic total development program combining the Leadership, Mental, Educational and Wellness facets of development into a single, affordable bundled service. Each of these four areas presents an impressive selection of valuable resources and information delivered by our elite, best-in-class team of experts. The Complete Athlete®360 platform offers a fully customizable menu of services allowing you to choose programming that fits your specific needs in order to achieve maximum, sustainable results. It is ideal for teams, coaches, administrators, athletic departments professionals and corporations. Complete Athlete®360 is designed to help you reach your full potential by partnering with you to address these needs.